Where could one encounter fluids or “gases” that would propagate with velocities close to the the speed of light? It was thought that it seemed a question to be very far away from any realistic or practical use. 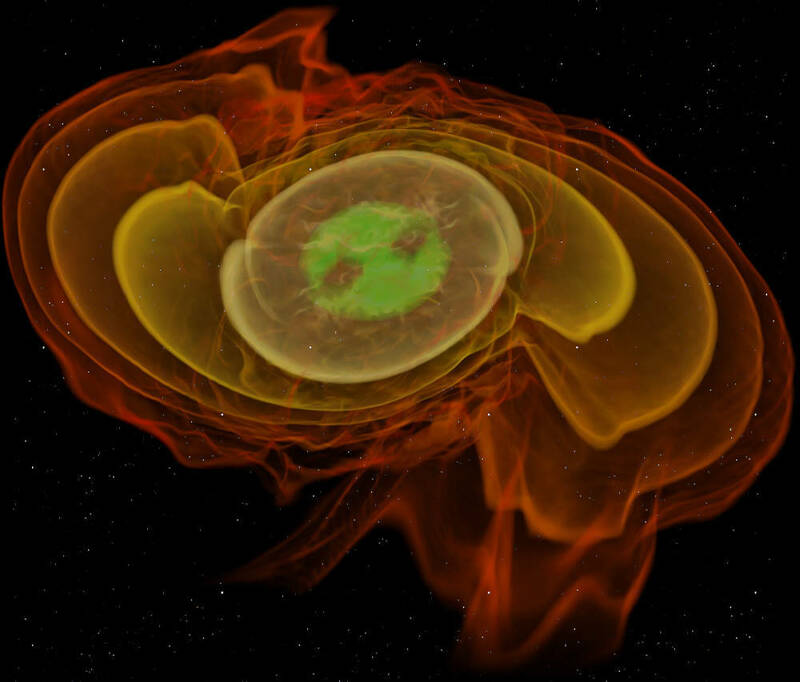 At present time, relativistic hydrodynamics IS an importan part of Cosmology and the theory of processes going on in the sorrounding and ambient space of neutron stars (likely, of the quark stars as well), compact massive objects and black holes. When the relativistic fluid flows under strong gravitational fields existing in those extreme conditions at relativistic speeds, it drives to a big heating and X-ray emission, for instance. And then, a relativistic treatment of matter is inevitable there. Caution note: I will use units with c=1 in this post, in general, without loss of generality. The continuity equation expresses the fact that mass in an invariant in classical fluid theory. The Euler equation says how the changes of pressure and forces affect to the velocity of the fluid, and finally the equation of state encodes the type of fluid we have at macroscopic level from the microscopic degrees of freedom that fluid theory itself can not see. This tensor is written in the rest frame of a fluid. Note, then, that ideal fluids are characterized b the feature that their stress tensor contains no shear stresses ( off-diagonal terms) and they are thus “proportional” to the Kronecker delta tensor . We can check that it effectively corresponds to the classical Euler equation moving to the comoving frame where , excepting for a pressure term equals to if we reintroduce units with the speed of light, and then it is the generalized mass-energy density conservation law from relativistic hydrodynamics! Remark: In the case of electromagnetic radiation, we have a pressure term equals to due to the tracelessneess of the electromagnetic stress-energy-momentum tensor. and it merely says that baryon number is conserved under reasonable conditions ( of course, we do suspect at current time that baryon number conservation is not a good symmetry in the early Universe, but today it holds with good accuracy). Similarly, it can be said that for an electron gas, the baryon density has to be replaced by the so-called lepton density in the equation of continuity, where we could consider a gas with electrons, muons, tauons and their antiparticles. We could guess the neutrino density as well with suitable care. However, for phtoons and “mesons” there is NO continuity equation since tehy can be created and annihilated arbitrarily. The inner energy is negative if energy is released at the formation of the state , e.g. in the binding energy of a nucleus, and it is positive if energy has to be spent, e.g. if we make a compressional work onto the state. In conclusion, we deduce that the time conservation of the relativistic conservation law of fluid hydrodynamics tell us that in the case of an ideal fluid no energy is converted into heat, and entropy itself remains constant! Isn’t it amazing? Entropy rocks! Final remark (II): Relativistic hydrodynamics can be generalized to charged fluids and plasmas, and in that case, it is called relativistic magnetohydrodynamics. One simply adds the stress-energy-momentum tensor of the electromagnetic field to the tensor of the fluid in such a way it is conserved as well, i.e., with zero divergence. Thus, we would get an extra Lorentz-like force into the relativistic generalization of the Euler equation! Final remark (III): The measurement of thermodynamical quantities like pressure, entropy or temperature, and its treatment with classical thermodynamics suppose that the thermodynamical equilibrium state is reached. Please, note that if it were not the case, we should handle the problem with tools of non-equilibrium thermodynamics or some other type of statistical mechanics that could describe the out-of-the equilibrium states ( there are some suggestions of such a generalization of thermodynamics, and/or statistical mechanics, from the works of I. Prigogine, C.Tsallis, C.Beck and many other physicists). “I propose to name the quantity S the entropy of the system, after the Greek word [τροπη trope], the transformation. I have deliberately chosen the word entropy to be as similar as possible to the word energy: the two quantities to be named by these words are so closely related in physical significance that a certain similarity in their names appears to be appropriate.” Clausius (1865). Entropy is one of the strangest and wonderful concepts in Physics. It is essential for the whole Thermodynamics and it is essential also to understand thermal machines. It is essential for Statistical Mechanics and the atomic structure of molecules and fundamental particles. From the Microcosmos to the Macrocosmos, entropy is everywhere: from the kinetic theory of gases, information theory as we learned from the previous post, and it is also relevant in the realm of General Relativity, where equations of state for relativistic and non-relativistic particles arise too. And even more, entropy arises in the Black Hole Thermodynamics in a most mysterious form that nobody understands yet. By the other hand, in the Quantum Mechanics, entropy arises in the (Von Neumann’s) approach to density matrix, the quantum incarnation of the classical version of entropy, ultimately related to the notion of quantum entanglement. I have no knowledge of any other concept in Physics that can appear in such diffent branches of Physics. The true power of the concept of entropy is its generality. The problem with this definition and this principle is that it leaves unanswered the most important question “what really is the meaning of entropy?“ Indeed, the answer to this question had to await the revival of atomic theories of the matter at the end of the 19th century. Really the base of the logarithm is absolutely conventional. Generally, it is used the natural base (or the binary base, see below). Why does it work? Why is the number of degrees of freedom related to the logarithm of the total number of available microscopical states? Imagine a system with 2 simple degrees of freedom, a coin. Clone/copy it up to N of those systems. Then, we have got a system of N coins showing head or tail. Each coin contributes one degree of freedom that can take two distinct values. So in total we have N (binary, i.e., head or tail) degrees of freedom. Simple counting tells us that each coin (each degree of freedom) contributes a factor of two to the total number of distinct states the system can be in. In other words, . Taking the base-2 logarithm of both sides of this equation yields the logarithm of the total number of states to equal the number of degrees of freedom: . This argument can be made completely general. The key argument is that the total number of states follows from multiplying together the number of states for each degree of freedom. By taking the logarithm of , this product gets transformed into an addition of degrees of freedom. The result is an additive entropy definition: adding up the entropies of two independent subsystems provides us the entropy of the total system. Time machine towards the past future. 20th century. In 1948, Claude Shannon, an electrical engineer at Bell Telephone Laboratories, managed to mathematically quantify the concept of “information”. The key result he derived is that to describe the precise state of a system that can be in states labelled by numbers with probabilities . Entropy is therefore a simple bit (or trit, cuatrit, pentit,…,p-it) counting of your system. The number of bits required to completely determine the actual microscopic configuration between the total number of microstates allowed. In these terms the second law of thermodynamics tells us that closed systems tend to be characterized by a growing bit count. Does it work? Yes, it does. Very well as far as we know…Even in quantum information theory you have an analogue with the density matrix. Even it works in GR and even it strangely works with Black Hole Thermodynamics, excepting the fact that entropy is the area of the horizon, temperature is the surface gravity in the horizon, and the fact that mysteriously, BH entropy is proportional not to the volume as one could expect from conventional thermodynamics (where entropy scales as the volume of the container) , but to the area of the horizon. Incredible, isn’t it? That scaling of the Black Hole entropy with the area was the origin of the holographic principle. But it is far away where my current post wants to go today. , do you prefer maybe ? That is, entropy is the same thing that information, excepting a minus sign! So, if you add the same thing to its opposite you get zero. It approaches a maximum value when , i.e., when the probability is a uniform distribution. There is a subtle issue related to the additive constant obtained from the above argument that is important in classical and quantum thermodynamics. But we will discuss that in the future. Now, we could be happy with this functional entropy but indeed, the real issue is that we derived it from some a priori axioms that could look natural, but they are not the most general set of axioms. And, then, our fascinating trip continues here today! There previous considerations have been using, more or less, formal according to the so-called “Khinchin axioms” of information theory. That is, The Khinchin axioms are enough to derive the Shannon-Gibbs-Boltzmann entropy we wrote before. However, as it happened with the axioms of euclidean geometry, we can modify our axioms in order to obtain more general “geometries”, here more general “statistical mechanics”. 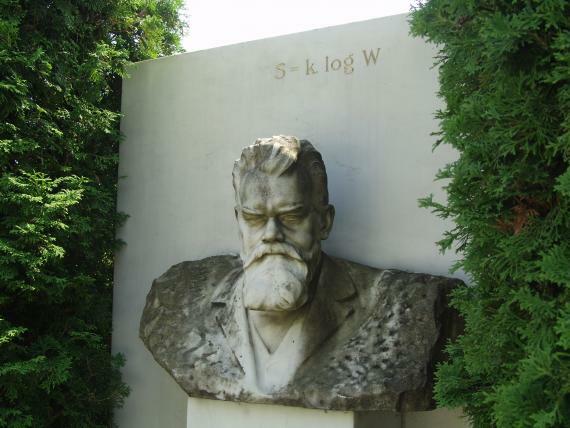 We are going now to explore some of the most known generalizations to Shannon entropy.In the succesive, for simplicity, we set the Boltzmann’s constant to one (i.e. we work with a k=1 system of units ). Is the above definition of entropy/information the only one that is interesting from the physical viewpoint? No, indeed, there has been an increasing activity in “generalized entropies” in the past years. Note, however, that we should recover the basic and simpler entropy (that of Shannon-Gibbs-Boltzmann) in some limit. I will review here some of the most studied entropic functionals that have been studied during the last decades. where the sums extends itself to any microstate with non zero probability . It is quite easy to see that in the limit the Rényi entropy transforms into the Shannon-Gibbs-Boltzmann entropy (it can be checked with a perturbative expansion around or using the L’Hôspital’s rule. and again, taking the limit q=1, Tsallis entropies provide the Shannon-Gibbs-Boltzmann’s entropies. Why consider such a Statistical Mechanics based on Tsallis entropy and not Renyi’s?Without entrying into mathematical details, the properties of Tsallis entropy makes itself more suitable to a generalized Statistical Mechanics for complex systems(in particular, it is due to the concavity of Tsallis entropy), as the seminal work of C.Tsallis showed. Indeed, Tsallis entropies were found unnoticed by Tsallis in other unexpected place. In a paper, Havrda-Charvat introduced the so-called “structural entropy” related to some cybernetical problems in computing. This means that if we built a Statistical Mechanics based on the Tsallis entropy, it is non-additive itself. Independent subsystems are generally non-additive. However, they are usually called “non-extensive” entropies. Why? The definition of extensivity is different, namely the entropy of a given system is extensive if, in the so called thermodynamicla limit , then , where N is the number of elements of the given thermodynamical system. Therefore, the additivity only depends on the functional relation between the entropy and the probabilities, but extensivity depends not only on that, but also on the nature of the correlations between the elements of the system. The entropic additivity test is quite trivial, but checking its extensivity for a specific system can be complex and very complicated. Indeed, Tsallis entropies can be additive for certain systems, and for some correlated systems, they can become extensive, like usual Thermodynamics/Statistical Mechanics. However, in the broader sense, they are generally non-additive and non-extensive. And it is the latter feature, its thermodynamical behaviour in the thermodynamical limit, from where the name “non-extensive” Thermodynamics arises. That is, in the case of normalized Tsallis entropies the rôle of (q-1) and -(q-1) is exchanged, i.e., -(q-1) becomes (q-1) in the transition from Tsallis to Landsberg-Vegral entropy. Abe entropy is also concave from the mathematical viewpoint, like the Tsallis entropy. It has some king of “duality” or mirror symmetry due to the invariance swapping q and 1/q. In the limit Kaniadakis entropy becomes Shannon entropy. Also, writing , and , Kaniadakis entropy becomes Abe entropy. Kaniadakis entropy, in addition to be concave, have further subtle properties, like being something called Lesche stable. See references below for details! In this functional form, SM entropy recovers Rényi entropy for , SM entropy becomes Tsallis entropy if . Finally, when both parameters approach 1, i.e., , we recover the classical Shannon-Gibbs-Boltzmann. It is left as a nice exercise for the reader to relate the above 2 SM entropy functional forms and to derive Kaniadakis entropy, Abe entropy and Landsberg-Vedral entropy for some particular values of from the second definition of SM entropy. However, entropy as a concept is yet very mysterious. Indeed, it is not clear yet if we have exhausted every functional form for entropy! Non-extensive Statistical Mechanics and its applications are becoming more and more important and kwown between the theoretical physicists. It has a growing number of uses in High-Energy Physics, condensed matter, Quantum Information and Physics. The Nobel Prize Murray Gell-Mann has dedicated their last years of research in the world of Non-Extensive entropy. At least, from his book The Quark and the Jaguar, Murray Gell-Mann has progressively moved into this fascinating topic. In parallel, it has also produced some other interesting approaches to Statistical Mechanics, such as the so-called “superstatistics”. Superstatistics is some kind of superposition of statistics that was invented by the physicist Christian Beck. The last research on the foundations of entropy functionals is related to something called “group entropies” and the transformation group of superstatistics and the rôle of group transformations on non-extensive entropies. It provides feedback between different branches of knowledge: group theory, number theory, Statistical Mechanics, and Quantum Satisties…And a connection with the classical Riemann zeta function even arises! 5) Mathematical Foundations of Information Theory, A. Y. Khinchin. Dover. Pub. A) What is the most general entropy (functional entropy) that can be build from microscopic degrees of freedom? Are they classical/quantum or is that distinction irrelevant for the ultimate substrate of reality? B) Is every fundamental interaction related to some kind of entropy? How and why? C) If entropy is “information loss” or “information” ( only a minus sign makes the difference), and Quantum Mechanics says that Quantum Mechanics is about information (the current and modern interpretation of QM is based on it), is there some hidden relationship between mass-energy and information and entropy? Could it be used to build Relativity and QM from a common framework? Therefore, are then QM and (General) Relativity emergent and likely the two sides of a most fundamental theory based on information only? I enjoyed as a teenager that old game in which you are told a message in your ear, and you transmit it to other human, this one to another and so on. Today, you can see it at big scale on Twitter. Hey! The message is generally very different to the original one! This simple example explains the other side of communication or information transmission: “noise”. Although efficiency is also used. The storage or transmission of information is generally not completely efficient. You can loose information. Roughly speaking, every amount of information has some quantity of noise that depends upon how you transmit the information(you can include a noiseless transmission as a subtype of information process in which, there is no lost information). Indeed, this is also why we age. Our DNA, which is continuously replicating itself thanks to the metabolism (possible ultimately thanksto the solar light), gets progressively corrupted by free radicals and different “chemicals” that makes our cellular replication more and more inefficient. Don’t you remember it to something you do know from High-School? Yes! I am thinking about Thermodynamics. Indeed, the reason because Thermodynamics was a main topic during the 19th century till now, is simple: quantity of energy is constant but its quality is not. Then, we must be careful to build machines/engines that be energy-efficient for the available energy sources. where H is called enthalpy, T is the temperature and S is the entropy. You can identify these terms with the previous concepts. Can you see the similarity with the written letters in terms of energy and communication concepts? Information is something like “free energy” (do you like freedom?Sure! You will love free energy!). Thus, noise is related to entropy and temperature, to randomness, i.e., something that does not store “useful information”. Internet is also a source of information and noise. There are lots of good readings but there are also spam. Spam is not really useful for you, isn’t it? Recalling our thermodynamic analogy, since the first law of thermodynamics says that the “quantity of energy” is constant and the second law says something like “the quality of energy, in general, decreases“, we have to be aware of information/energy processing. You find that there are signals and noise out there. This is also important, for instance, in High Energy Physics or particle Physics. You have to distinguish in a collision process what events are a “signal” from a generally big “background”. We will learn more about information(or entropy) and noise in my next log entries. Hopefully, my blog and microblog will become signals and not noise in the whole web. Unfortunately, in those times, as an undergraduate student, my teachers were not very interested in this subject. What a pity! Concepts in Thermal Physics, by Stephen Blundell, OUP. 2009. A really self-contained book on Thermodynamics, Statistical Physics and topics not included in standard books. I really like it very much. It includes some issues related to the global warming and interesting Mathematics. I enjoy how it introduces polylogarithms in order to handle closed formulae for the Quantum Statistics. A really old-fashioned and weird book. But it has some insights to make you think about the foundations of Thermodynamics. This really tiny book is delicious. I learned a lot of fun stuff from it. Basic, concise and completely original, as Fermi himself. Are you afraid of him? Me too! E. Fermi was a really exceptional physicist and lecturer. Don’t loose the opportunity to read his lectures on Thermodynamcis. Mere Thermodynamics. Don S. Lemons. Johns Hopkins University Press. Other great little book if you really need a crash course on Thermodynamics. Introduction to Modern Statistical Physics: A Set of Lectures. Zaitsev, R.O. URSS publishings. I have read and learned some extra stuff from URSS ed. books like this one. Russian books on Science are generally great and uncommon. And I enjoy some very great poorly known books written by generally unknow russian scientists. Of course, you have ever known about Landau and Lipshitz books but there are many other russian authors who deserve your attention. An Introduction to Information Theory: Symbols, Signals and Noise. Dover Pub. 2nd Revised ed. 1980. John. R. Pierce. A really nice and basic book about classical Information Theory. 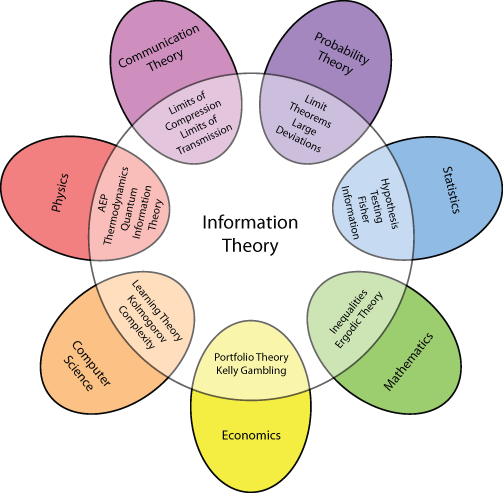 An introduction to Information Theory. Dover Books on Mathematics. F.M.Reza. Basic book for beginners. The Mathematical Theory of Communication. Claude E. Shannon and W.Weaver.Univ. of Illinois Press. A classical book by one of the fathers of information and communication theory. Mathematical Foundations of Information Theory. Dover Books on Mathematics. A.Y.Khinchin. A “must read” if you are interested in the mathematical foundations of IT.